Avoid Water StainsThe most essential task is to prevent any water stain on your shower glass enclosure. Water stain may turn into residue and over time can etch the glass. There are a couple of things home owner can do to avoid such stains. The easiest solution is to purchase a squeegee and utilize it after taking a shower. 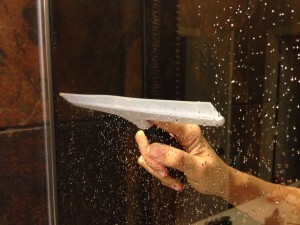 Another method is to use a towel to wipe down the shower glass. Use liquid soapWe all have used bar soap since our childhood. However, times are changing and there are plenty liquid body wash and shower gels options out there. Bar soaps tend to leave drips and chunks in your shower area. To avoid scraping soap drips, you have to clean the soap ledge with a piece of cloth every time you shower. The easiest solution to avoid such hassle is to change to liquid soap. As long as the body wash bottle doesn’t leak, your shower will be free of soap drips. Prevent Dirty Feet MarksDirty feet are most likely the cause of a filthy shower floor. When you walk around with flip flops, your feet mostly will have black or brown bottoms. As soon as you walk into a shower with white flooring or white bath tub, you can see a black foot print. If the stain is not cleaned up right away, the shower floor may be stained permanently. To prevent this, wipe your feet with a wet paper towel or a cloth before entering the shower area. In case you forget to clean your paws, try to keep a cleaning brush in the shower and give a quick scrub before finishing up your shower.If your shower is too filthy, it may be time to renovate your bathroom. Home Platinum Services can handle any size bathroom remodeling project, connect with us on Google+, Twitter, YouTube, Facebook, Pinterest, Houzz or you can Call Us at 214-773-8540.